Japanese sword – a weapon or a work of art? The Japanese sword, also known as katana, is mainly known as a weapon but for the Japanese people, swords have always been something more. They belonged to the gods. Katana has an extremely sharp blade. It is unbreakable and unbending. For centuries, the sword has also been considered the soul of samurai. Currently, the Japanese sword is used in martial arts to train the mind. It is believed that the deity lives in a sword, which is why they are often used in sacred rituals. 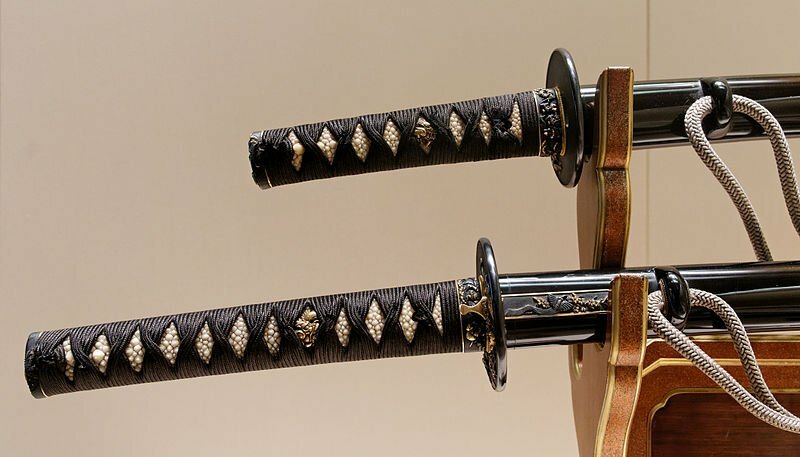 Due to their beautiful form, Japanese swords are also valued as works of art. In Japan, the possession and use of swords is strictly regulated by law and each sword must be publicly registered. However, they are registered in a cultural agency and considered as objects of art, not weapons. Sharpness of Japanese swords is legendary and there are even stories of a sword blade cutting clean through a metal helmet. Although swords have been used as weapons for centuries, nowadays they are appreciated as amazing pieces of art made of steel. They are also collectors’ items not only in Japan, but all over the world. There are auctions organized thanks to which Japanese swords gain an established position in the world. A sword of artistic value can be bought for about one million yen. For a really special katana you have to pay up to 2.5 million yen. The Japanese sword consists of a cutting edge, a back and a steel surface in between. On the side of the sword is visible wavy area. This is called Hamon or temper pattern. It is a pattern created during the hardening of the sword. To appreciate the Japanese sword, first look at it as a whole. Appreciate the curvature and balance, and then go to the details. The most important is temper pattern. Elements of nature as mountains and clouds are used as motifs and there are cherished. Japanese swords have long been a symbol of samurai. They are also used in iaido martial arts, whose aim is perfect artistry and spiritual discipline. At every iaido competition, people with exceptional skills can demonstrate the forms of iaido and show their skills. Real swords are used and you can fell tension and focus during performance. There are various schools of the sword, and their students devote themselves to continuous improvement. From ancient times, swords were considered sacred objects imbued with spiritual power. The Japanese sword has over 1500 years of history and it is more than just a great weapon. For about 1000 years, aristocrats used swords in Shinto ceremonies and rituals. Ceremonial swords were beautifully decorated and they were used as a show of power and wealth. Even in times of war, swords never became a weapon chosen on the battlefield. Spears and pistols were considered more effective weapons and katana were reduced to an auxiliary role. Instead, they were the most important element of the Samurai costume and the well-made sword was very expensive. Japanese katana are nowadays associated with samurai but there was a time when everyone could have a sword. In the 16th century, Toyotomi Hideyoshi, a Japanese military and political leader, issued an order to confiscate swords. He would not allow anyone outside the samurai class to have katana. This created a clear difference in status between samurai and ordinary people and gave birth to the concept of the sword as the mark of the samurai. When peace spread throughout Japan in the 17th century, samurai remained the only class of people allowed to wear a sword. As it become less common for a sword to be drawn the act of doing so acquired greater significance. Eventually not drawing a sword came to be considered a virtue. 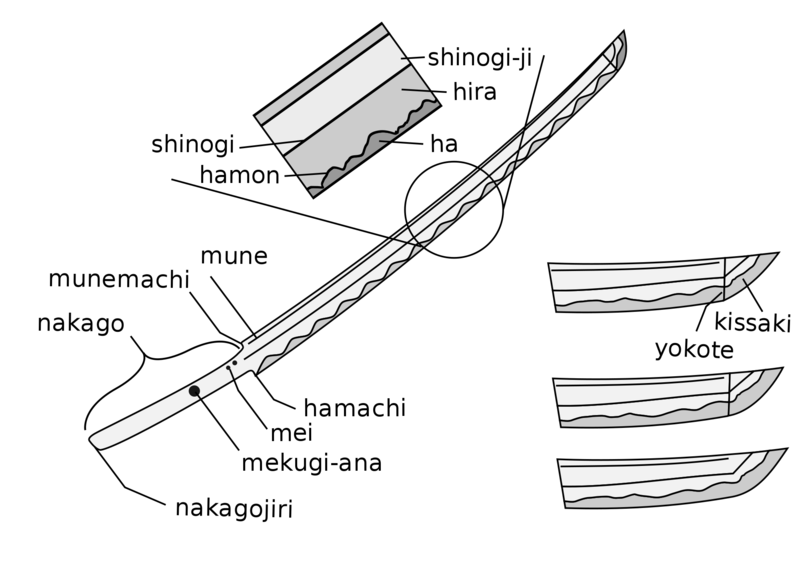 In this way, the katana steadily gained a deeper respect as a symbolic object. This state of affairs was broken in the nineteenth century, when the government dissolved the class of warriors and forbade the possession of swords. The era of the sword as a status mark has come to an end. But they still live in martial art and as works of art. Even today, they are adored by many Japanese. The Japanese swords were usually beautifully decorated, here the hilt was wrapped in shark skin and then in silk. 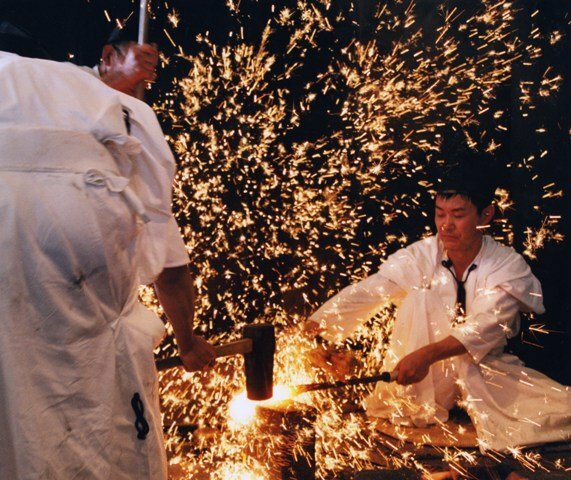 The metal for the Japanese sword is made by using a traditional method called tatara. The iron is heated for three days and three nights, while adjusting the temperature. The product of this heating is called tamahagane. It is thrown into the fire and heated to around 1500 degrees Celsius. Then tamahagane is hammered to modify its shape and thickness. When it is broken up to a thickness of 5 mm, it is placed in water to cool it down. Then it is broken into smaller blocks. Parts that break easily are hard and used on surfaces where sharpness is required. The difficult to break parts are more resistant and used in the core of the sword to provide it with flexibility. Small tamahagane blocks are arranged in an even pile so that heat can penetrate in the same way through each element. Then the metal is covered with ash and topped with water. It cuts off the access of air and allows the heat to penetrate slowly inside. The steel melts and then is hammered again, which strengthens it and improves its quality. After about 15 cycles of folding, heating and forming the blade, it has a thickness of 15,000 layers. This is what gives the strength and reliability of Japanese swords. Then the steel is extended with a small hammer. This determines the shape and is the process in which the skill of the craftsman is crucial. After forming the shape, a mixture of clay, charcoal and other materials is spread over the blade. The thickness of this layer is increased in some places. The mixture and its thickening influence the heat transfer in the final thermal treatment and determine the characteristic pattern on the blade. The sword is heated to 800 degrees and then submerged in water for cooling. This is the most intense moment for the creator of the sword. A sudden change in temperature naturally underlines the beautiful curvature of the katana. In this short moment the soul enters into blade. Then it is passed to craftsmen who polish the surface in order to finish the creation of the sword. Based on technique, instinct and years of experience, masters in this art still produce the highest quality blades.One of them is Yoshiaki Sugita who constantly invents unique methods to create blades of unusual originality. He is one of the most valued swordsman in Japan. One day he received iron in a very valuable form – these were nails made over 200 years ago. These nails were collected during the repair of the famous temple from over 1200 years – Suo Kokubunji. It is believed that when it comes to materials for sword, the older the metal, the better. Ancient nails were melted to make the raw material. 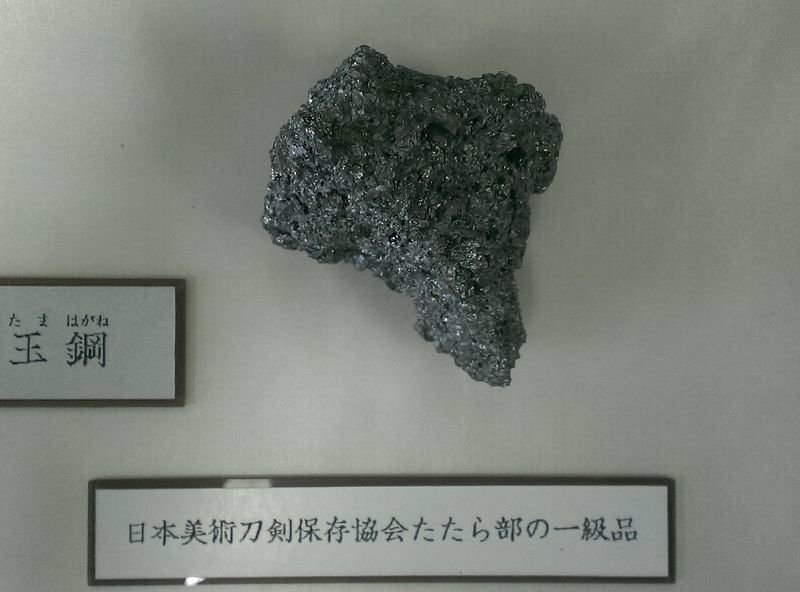 Iron from 200 years ago was something that Sugita had never used before. He could not use the rules of making swords he knew. He had to rely mainly on his instinct. He wanted to recreate Juka-choji – a pattern on the edge of a knife from the Kamakura period, which represents the overlapping petals. However, the method of creating this pattern is shrouded in mystery. Sugita tried to recreate it for almost 30 years. Without success. However, old temple nails could give him a chance to get a petal pattern. It took him half a year and one failure to recreate a blade with Juka-choji pattern. During the offering ceremony, Sugita offered sword to the temple. Japanese swords are used even today in Shinto ceremonies throughout the country. In Seki, a city in the Gifu prefecture that has more than 700 years of sword history, the New Year begins with the first sword hammering ceremony. The local monks demonstrate their skills and pray for prosperity and security. Every spring in Saitama prefecture there is a festival during which people try to climb barefoot on a ladder make of Japanese swords. If they reach the last level safely, it is said that their prayers will be answered. Everyone can participate and pray for a year of health and safety. In the Niigata prefecture, an autumn ritual has been taking place for several centuries. People walk around from one house to another performing mock duels with Japanese swords. It is believed that it repels the evil and provides abundant harvest. At each home sake and food are offered to the participants. At the end of the year, in the Miyazaki Prefecture there is a ritual with over 500 years of history called Haraikawakagura. It’s a holy dance with Japanese swords. It is a prayer to the deity that protects the land of Miyazaki. How you can see, Japanese swords still play a role in modern Japan. Both as art objects and sacred objects used in Shinto rituals. From ancient times in Japan, it was believed that swords protect people from disaster. They are also passed down from generation to generation as family treasures depicting people’s wishes for well-being and long life. It is a vivid personification of Japanese aesthetic and artistic temperament, which is now gaining popularity all over the world. 1. The Art of the Japanese Sword: The Craft of Swordmaking and its Appreciation, Y. Yoshihara.